Number 647 is a very special part of the collection of trams as it represents the very last traditional full sized passenger tram ever built in Britain. Ever since the first horse drawn tram rolled out of a factory in Birkenhead in 1860, Britain had produced tens of thousands of tramcars, but with 647 this came to an end. The future for trams was to be very different after 647 was built, with modern articulated vehicles becoming the standard design, manufactured by large European firms. 647 was the last of eight trams built to help modernise the Blackpool tramway and operate the year round service from Starr Gate to Fleetwood. They were known as the Centenary Cars as they were in the process of delivery when Blackpool celebrated a hundred years of tramcar operation in 1985. Many people notice the resemblance to a bus; this is deliberate, with the body designed to include as many standard bus parts as possible to reduce ongoing maintenance costs. It had a very busy career in Blackpool and was extensively rebuilt in 2003, with the front end design altered to eliminate the expensive curved windscreen. 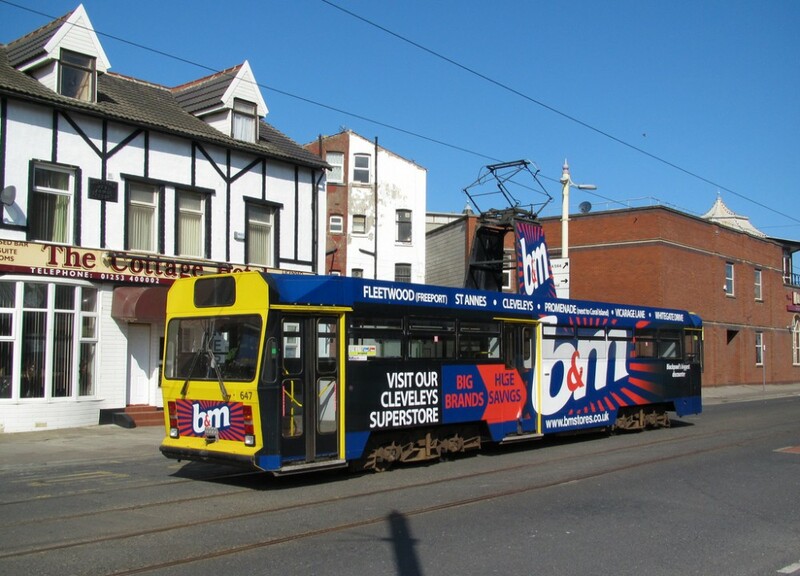 Despite this work, it was withdrawn from service in 2011 ahead of the modernisation of the Blackpool tramway and the introduction of new articulated trams and this important tram was then acquired for preservation by NEETT. 647 was originally painted in the Blackpool fleet colours of green and cream but it succumbed to its first all over advert only two years after being delivered, Although it briefly regained corporate colours in 1994 it has spent the majority of its career panted in various garish advertising schemes. Thus a competition was held to determine an appropriate colour scheme for 647 to carry; as a result it will be restored to the red, white and teak livery which Blackpool trams carried in the 1920’s, long before 647 itself was built.